I’m about to start week 3 of a new training cycle. In reviewing my HRV trend from the past two weeks you’ll see a massive change from week 1 to week 2. Clearly, last week was significantly more stressful than week 1. This was unintentional. I decided to do some calculations to see what may have happened. The goal of this phase is to progressively accumulate volume with moderate loads over a 3 week period with a slight reduction in week 4. However, I am very undisciplined in these phases and always go heavier than I should, too soon. I vary set/rep ranges each week but try and stick to lower RPE’s. I like to really focus on technique development during these phases since the loads are supposed to be lighter. Total volume was pretty much unchanged but should’ve increased slightly. RPE generally went up to 9’s on my last set in each workout of week 2 (straight sets) but should’ve remained at 8 or below (no chance I was taking weight off the bar though -my meathead-self trumps my logical-self in the gym quite often). Number of lifts decreased by 20% yet volume was matched due to a relative increase in intensity; too much, too soon. If my goal was to increase training density, than I would’ve been quite successful. I selected weight ranges in week 2 that should’ve been at the appropriate RPE based on estimations. However, for whatever reason, starting on Monday the weight didn’t feel as light as it should have. Rather than lower the load like I should have, I simply performed less sets. Regarding HRV, I do expect to see some progressive decline as volume increases, but not a -8 weekly change. Though I can’t think of anything major outside of training that could’ve contributed to the significant change in the trend, non-training related stressors are always a factor, whether we perceive them to be or not. In conclusion I failed to accomplish my goal of progressively increasing volume with moderate loads but rather increased training density purely as a result of undisciplined load selection. 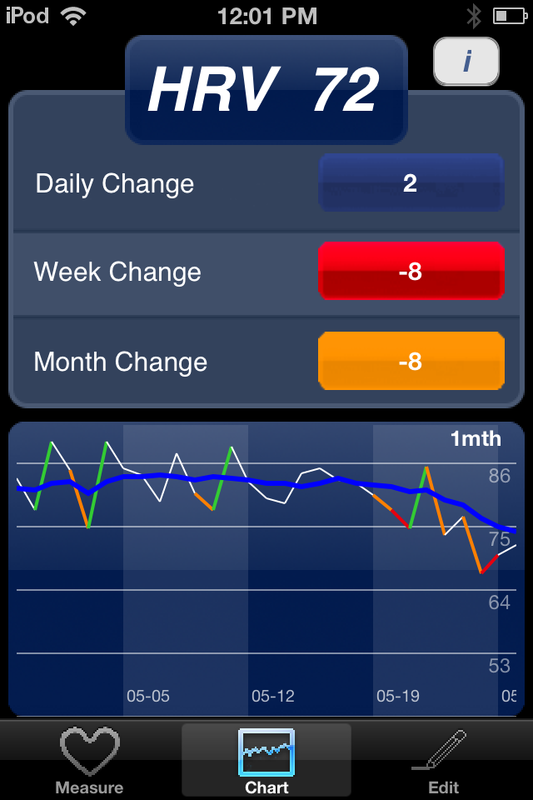 HRV responded with a significant decrease in the trend and I am now starting week 3 in the hole. Lesson learned. This entry was posted in Heart Rate Variability, Training Log and tagged density, heart rate variability, HRV, RPE. Bookmark the permalink.